North Korea sent three planes to Singapore on Sunday with one likely carrying its leader who is set to hold the first-ever summit talks with the president of the United States this week, the South's government and a flight route-tracking website said. According to Flightradar24 and official sources here, the Chammae-1 -- an Ilyushin-62M passenger jet -- which is the North Korean leader's private jet, departed Pyongyang Sunan International Airport at 9:30 a.m. and is flying in a southeastward direction without revealing its flight number. The website earlier detected a separate takeoff by an Air China airplane heading for the same destination at 8:30 a.m., after it discreetly landed in North Korea for a brief stop that last about an hour. The departures of the two planes come shortly after Pyongyang sent an Ilyushin-76 cargo plane to Singapore, according to the sources. Initially, the Chinese plane reported it was flying to Beijing but suddenly changed its flight number to CA61 from CA122 with its heading set for Singapore, the website showed. The website said earlier the same plane had landed in the North's capital at 7:20 a.m., after leaving Beijing Capital International Airport at 4:18 a.m.
Who boarded the plane from the communist state is still unknown, but speculation is growing that it might be flying North Korean leader Kim Jong-un to Singapore, two days ahead of the historic summit with U.S. President Donald Trump in the city-state. Air China's usual Pyongyang-bound routes run three times during weekdays. There is no known flight to Pyongyang on weekends. The Boeing 747-4J6 that traveled to North Korea is known to be a private jet used by the Chinese government to carry its high-level officials, including President Xi Jinping. The website did not specify the destination of the plane. Many government chartered planes are known to keep their routes discreet due to security issues. The use of the Chinese jet may be due to safety reasons, since the Il-62M is seen as being old and having less range. The use of several planes may also be related to the need to ferry cargo and staff who will accompany Kim on this important trip. The website reported late Saturday that another Chinese airplane landed in Singapore after leaving Pyongyang, in what experts and watchers predicted may be North Korea's advance team for the summit talks. 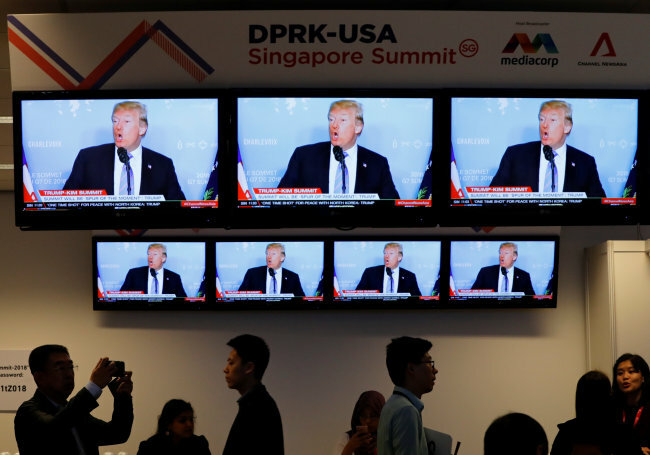 Trump and Kim are set to meet in Singapore on Tuesday to try to reach a deal on dismantling the North's nuclear weapons program in exchange for security guarantees.